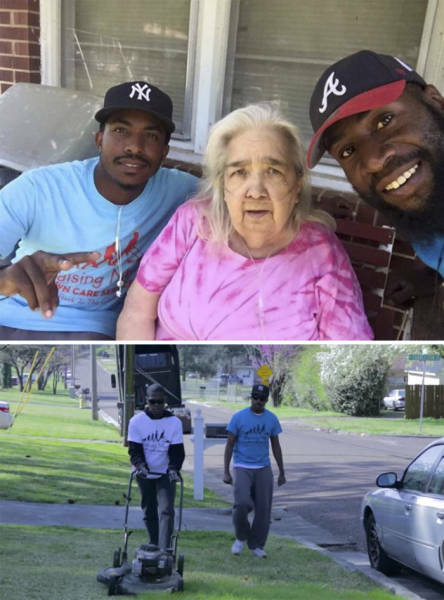 There are lots of photos and news on the internet for faith in humanity, so I had to select and post best and most inspiring stories that may both popular and not be quite so widely known. 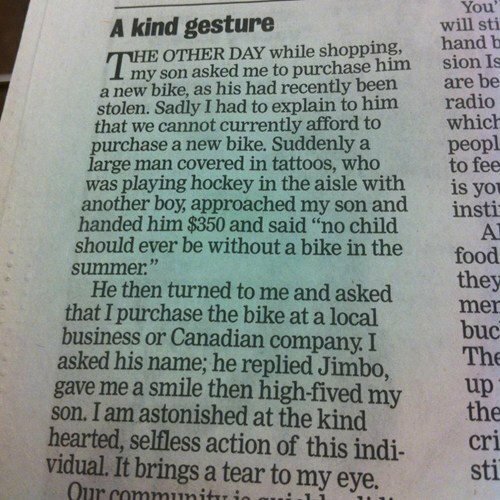 Enjoy these Amazing Pictures and Stories it will restore your Faith In Humanity. 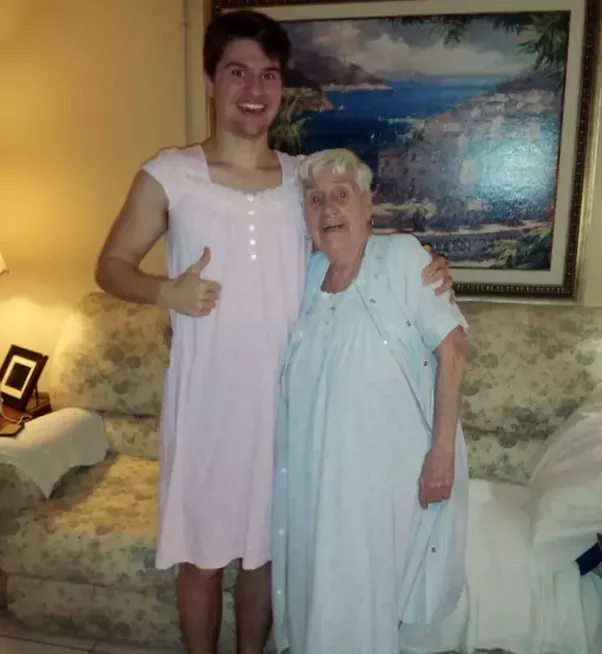 This modest 84 year-old grandma was embarrassed at wearing a nightgown in front of strangers, so her grandson wore one in solidarity. This young man with Down syndrome was so excited to meet his favorite band Maroon then he had a panic attack. 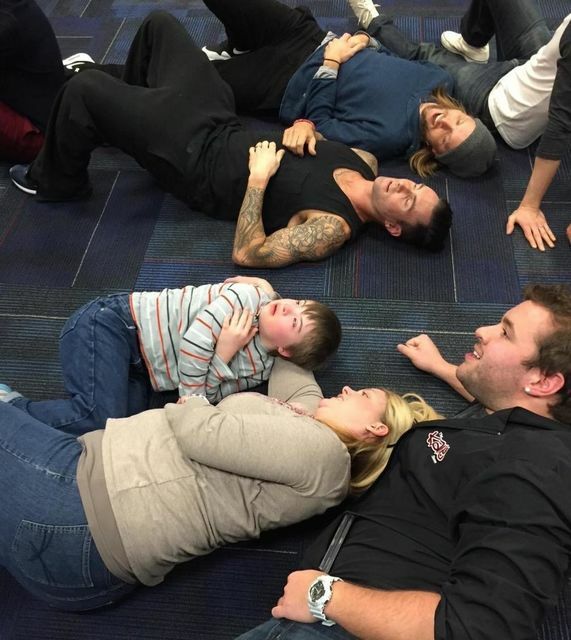 He had to lie down on the floor until he felt better, so the band laid down right there with him. 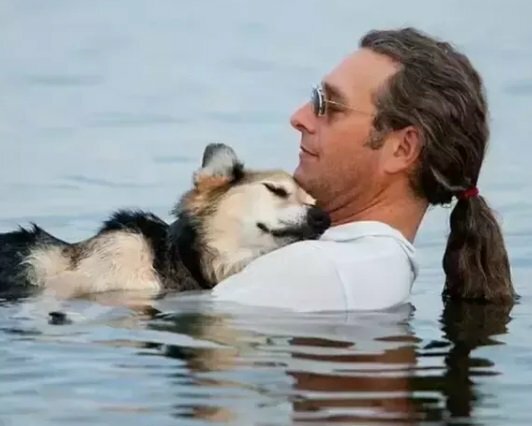 This man takes his dog to float in the lake each evening because the water eases the pain of his dog’s arthritis. These are brothers, Lucas and Noah. Lucas has Lissencephaly. 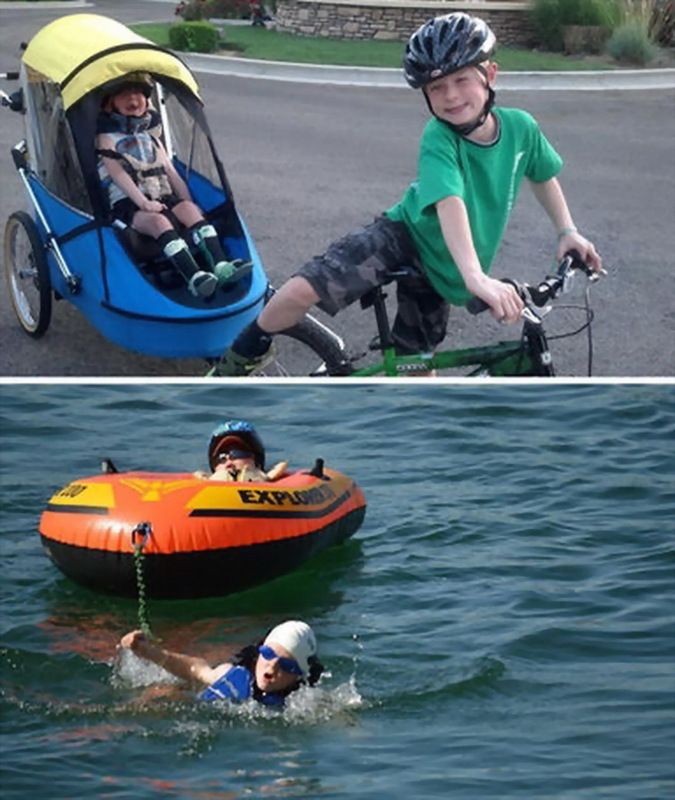 Noah heard about a local youth triathlon and wanted to compete in it, but he wouldn’t take part unless Lucas could take part alongside him. He trained for three months to build the strength and endurance he would need to get them both through it, and get them through it he did. They completed the entire event in 54 minutes. 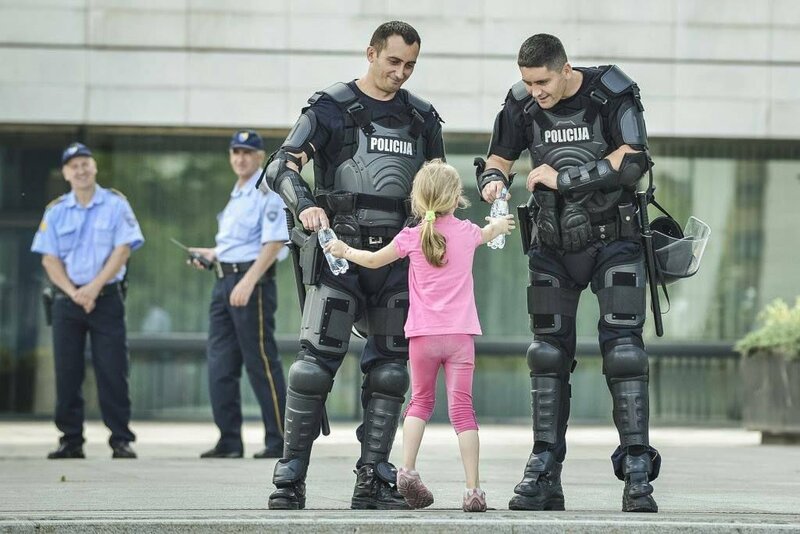 A young girl shares a bottle of water to Bosnian police. Bosnia. 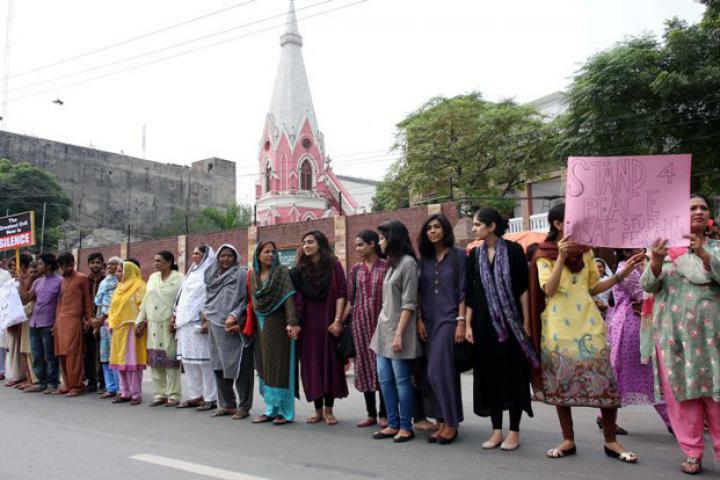 October 2013, Pakistan – Muslims form a Human chain to protect Christians during Lahore mass. 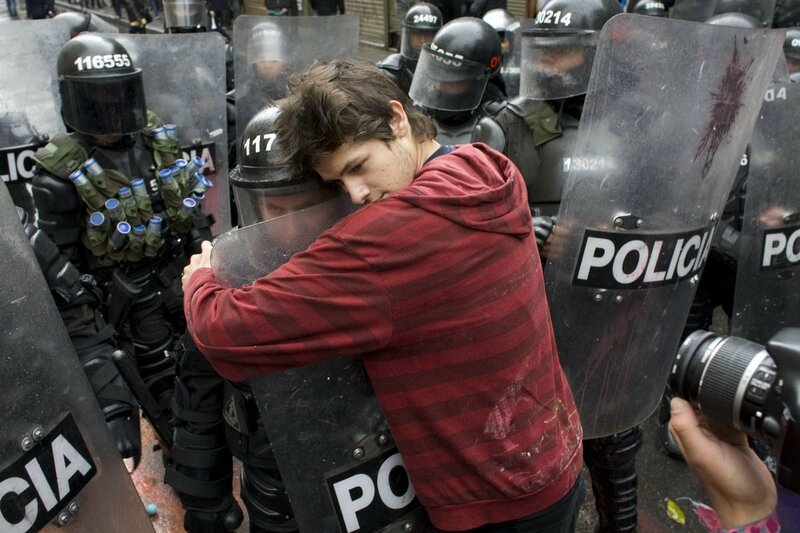 Bogota, Colombia – A demonstrator embraces a riot police officer during a student protest against government plans to reform higher education. These two babies were complete strangers, but they decided to give each other a big hug at the airport. The young patient in the bed was an eleven-year-old boy who had an inoperable brain tumour. 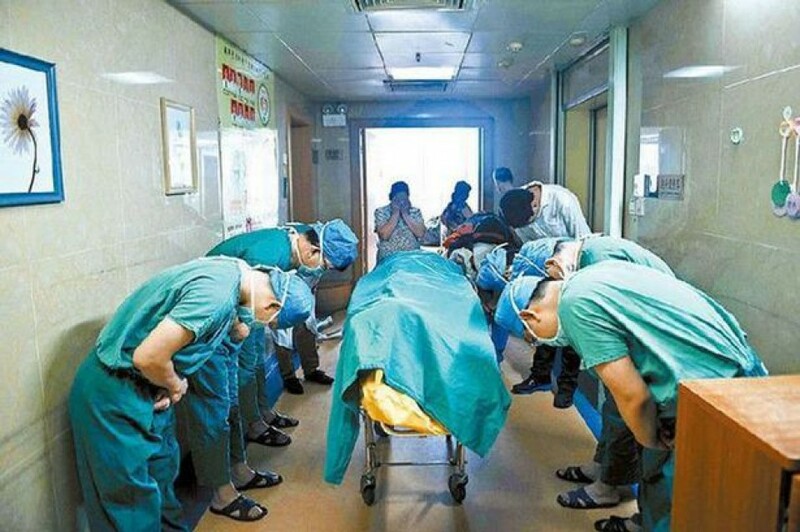 The medical staff bow to him in gratitude and respect because he made a request that his organs be harvested and donated to save the lives of other children after his death. 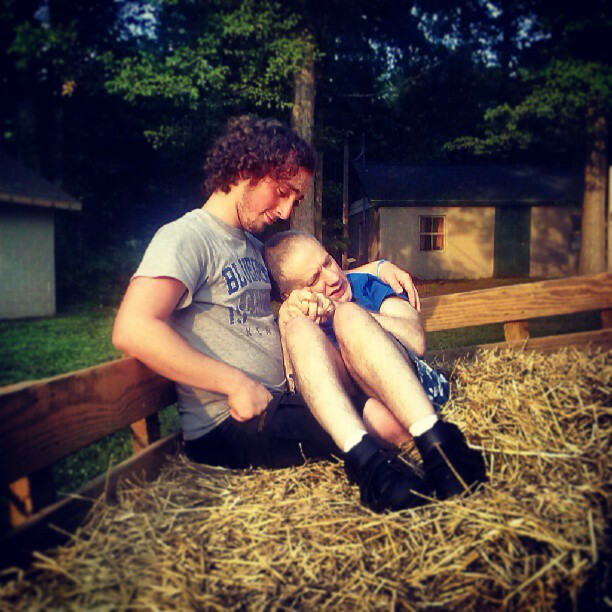 A guy named Tully wanted to help this 46 year-old wheelchair bound man to take part in a hay ride, so he picked him up and cradled him in his arms during the ride. The guy was so thrilled to be on the ride that he peed, soaking himself and Tully. Tully stayed with the guy on the rest of the 40-minute ride, then cleaned him up and dressed him in clean clothes before changing his own. 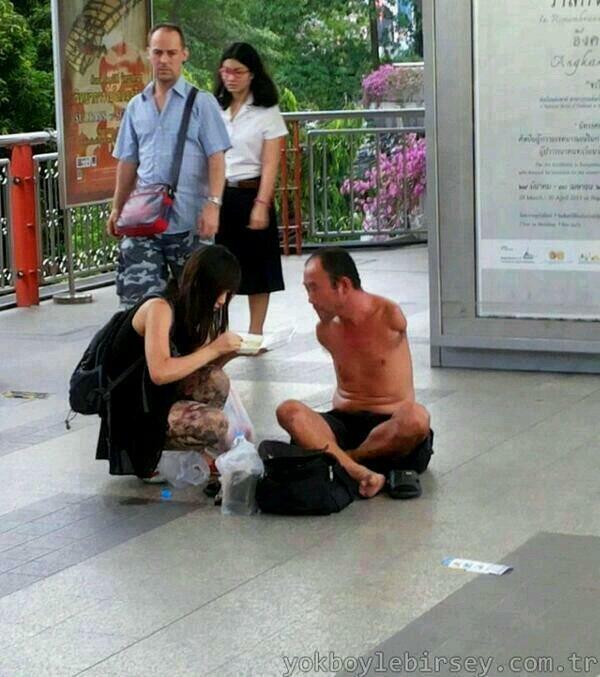 The kindness of stranger, who fed homeless people who could not feed themselves. 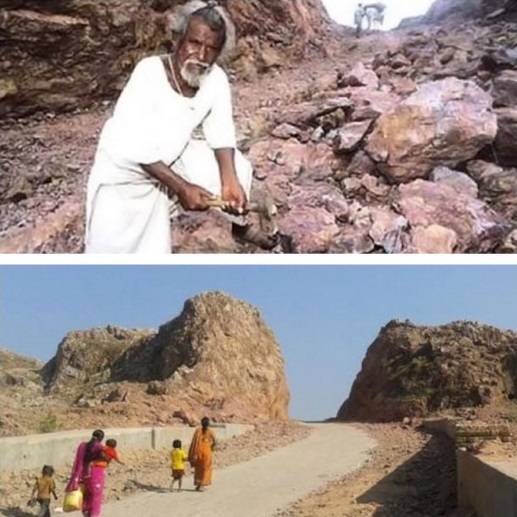 Dashrath Manjhi cut through a mountain single handed for 22 years, day and night, to ensure no one dies from not being able to access medical care like his wife did. He reduced the distance from 70 km to 1 km from his village to the hospital. 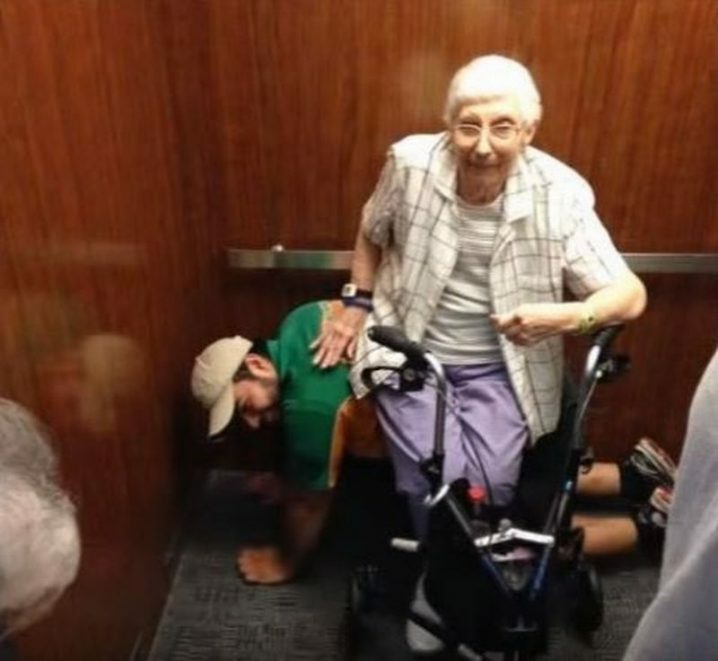 This young man became a human chair to help a disabled lady sit down and ease her arthritis after they had become stuck in an elevator. 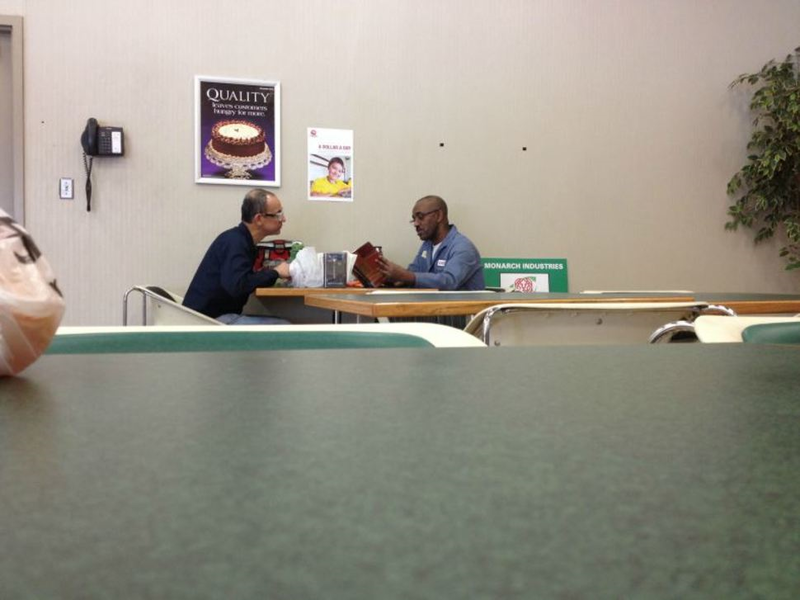 These two pals sit together at lunch every day, and one reads to the other who cannot read. 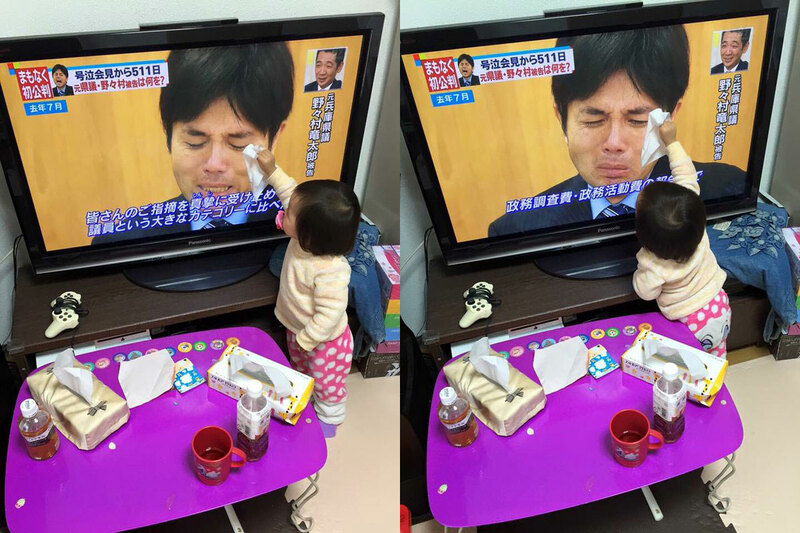 This precious little girl tries to wipe away the tears of the man she sees weeping on the television screen. Nobody came to this little autistic boy’s birthday party, so his momma took to Facebook for help. 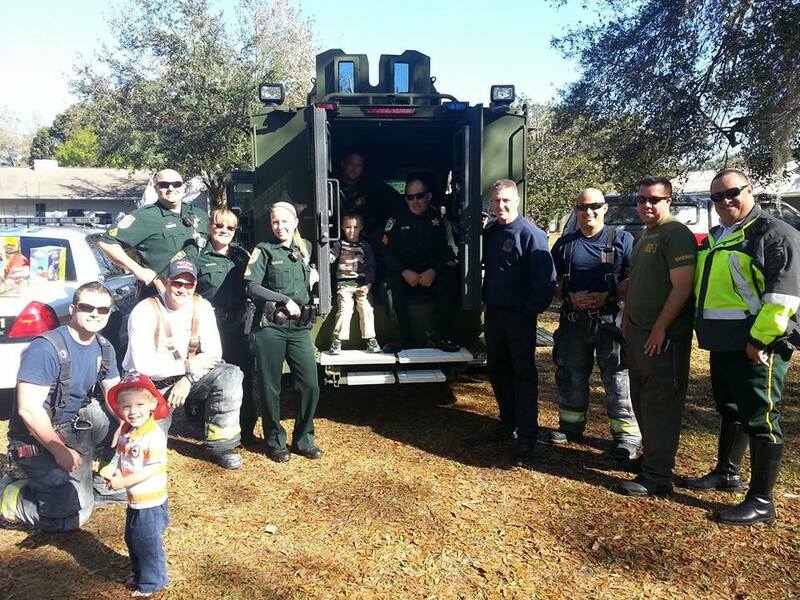 Soon, firefighters, police officers, and local kids all turned up to help him celebrate his birthday! 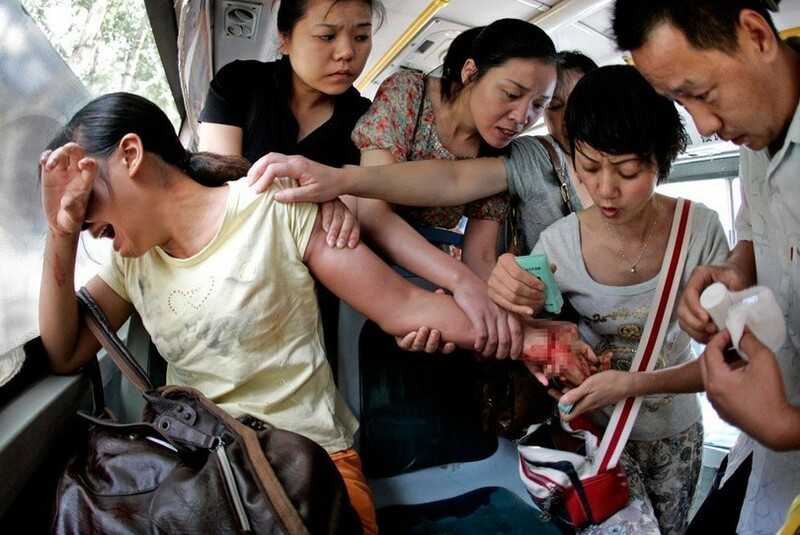 China - people save this young woman from committing suicide. 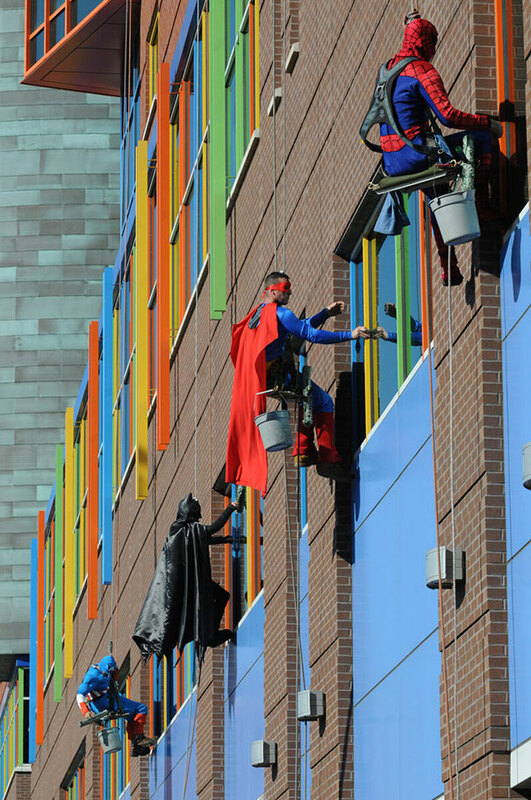 Workers from memphis cleaning company dress up as superheroes to cheer up patients at children's hospital in le bonheur. 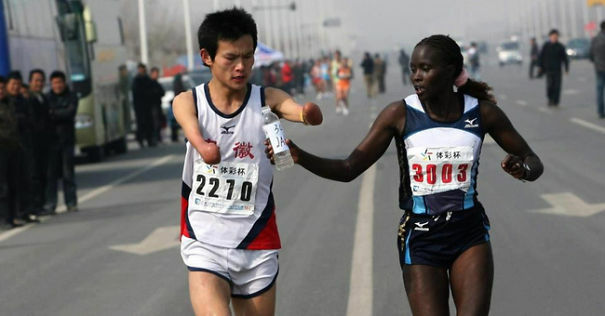 Jacqueline Kiplimo helps a disabled runner finish a marathon in Taiwan, costing her a first place finish. 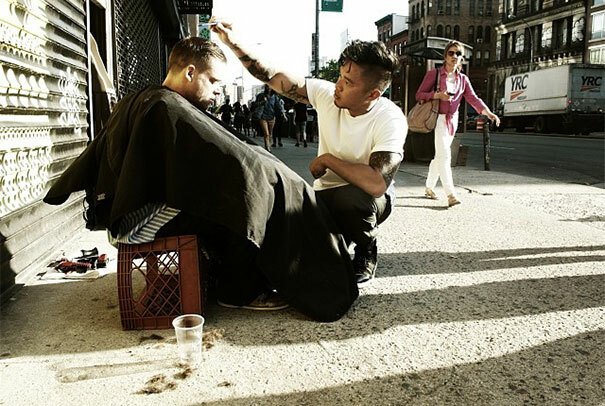 Every Sunday, this new york hair stylist gives free haircuts to the homeless. Officer talks man out of committing suicide. 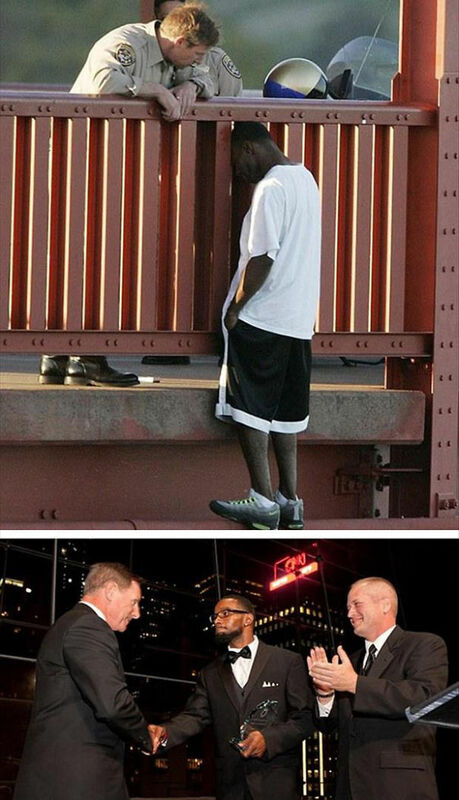 Eight years later, the now-father-of-two gives the officer an award at the American foundation of suicide. 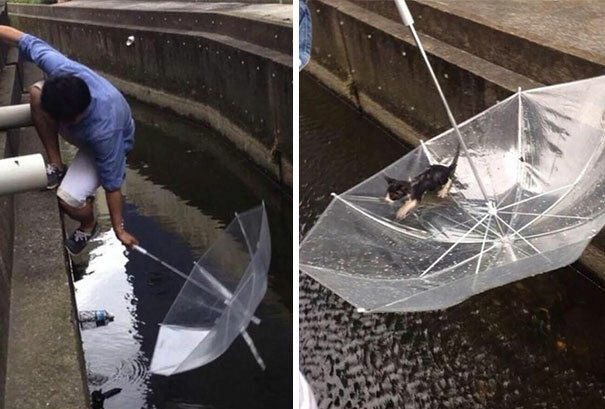 Man saves a drowning kitten with an umbrella. 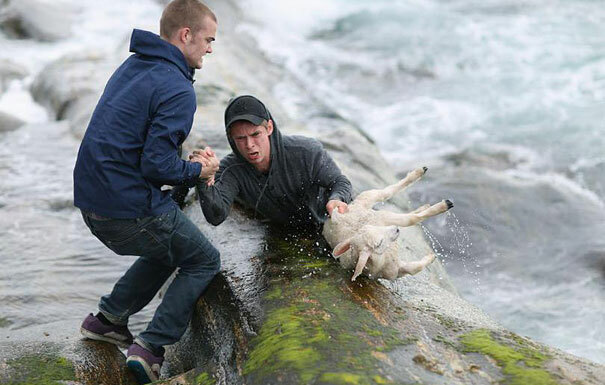 Two norwegian guys rescuing a baby lamb drowning in the ocean. 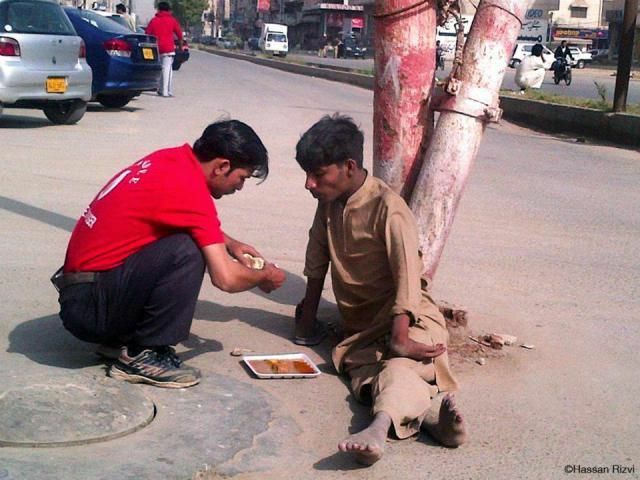 A waiter at a restaurant buys food and feeds disabled beggar with his own hands. 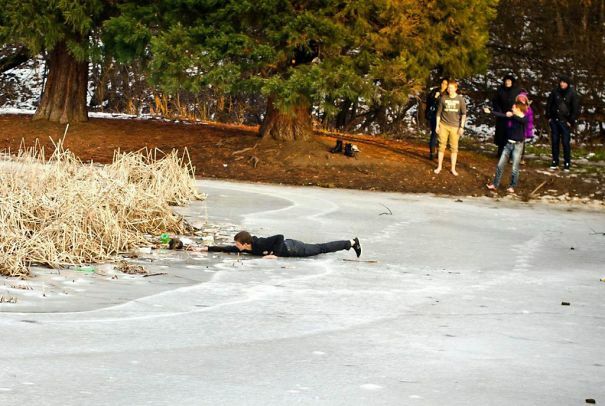 Norwegian guy plunges into frozen lake to rescue drowning duck. 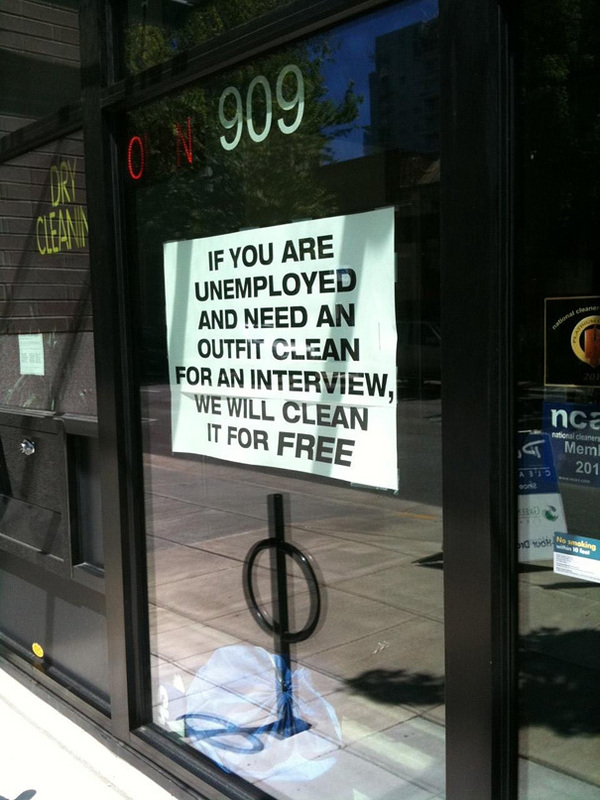 Free dryclean for jobless people. 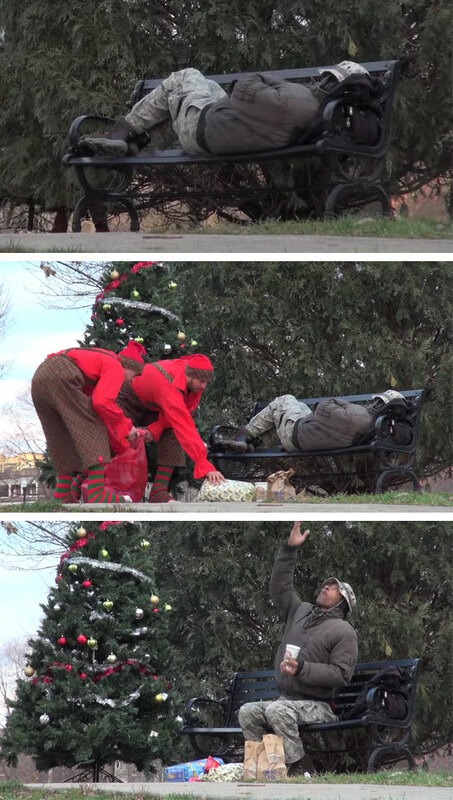 Christmas Elves Surprise The Homeless With Food And Gifts. 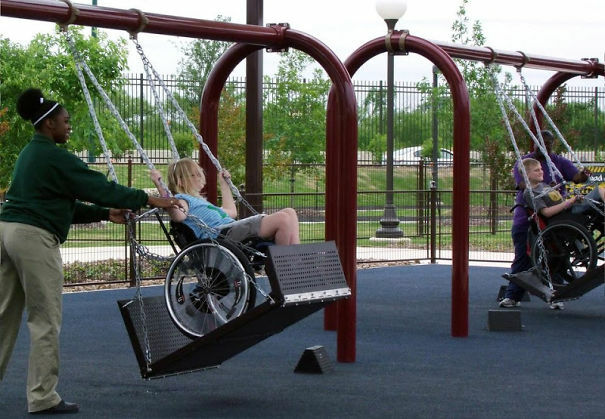 People built swings for children in wheelchairs. 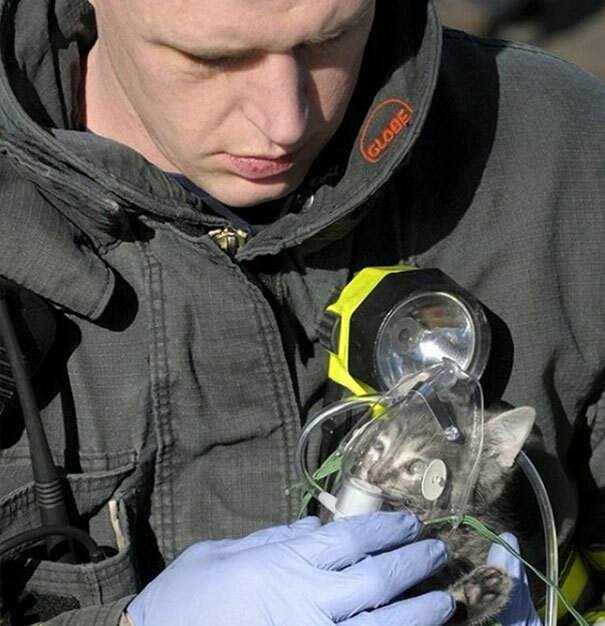 Firefighter administers oxygen to cat rescued from house fire. 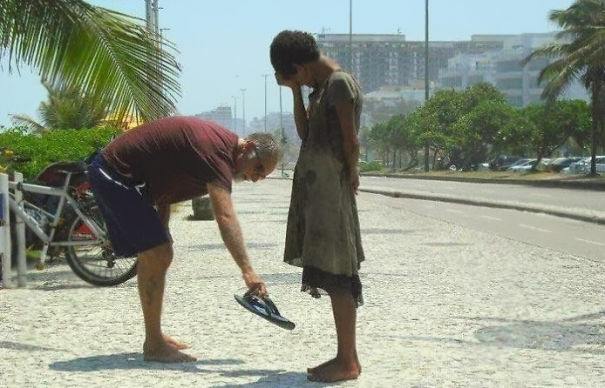 A man gives his shoes to a homeless girl in rio de janeiro. 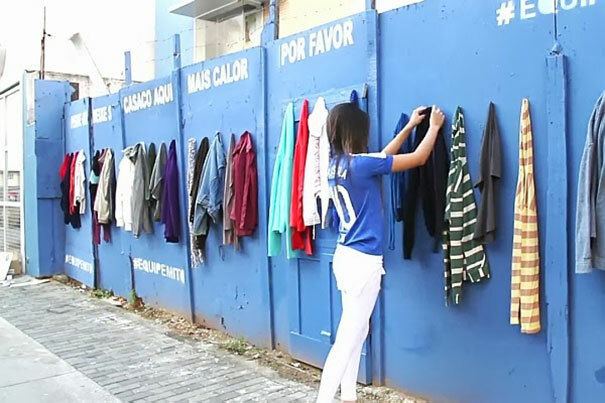 A wall of donated clothes for homeless people to take. 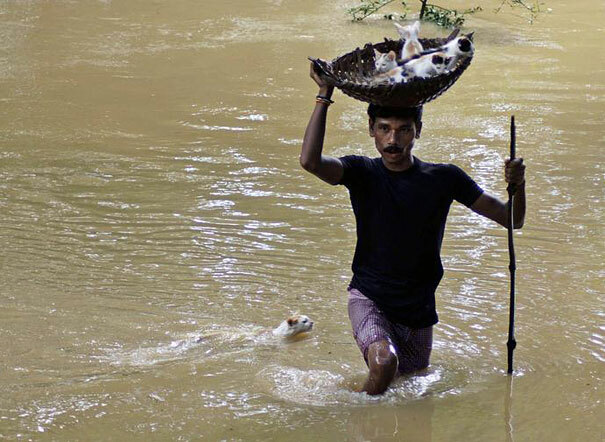 A man carries kittens on a basket towards dry land. Teenage boy rescues a stray dog from drowning in a frozen lake (sofia, bulgaria). 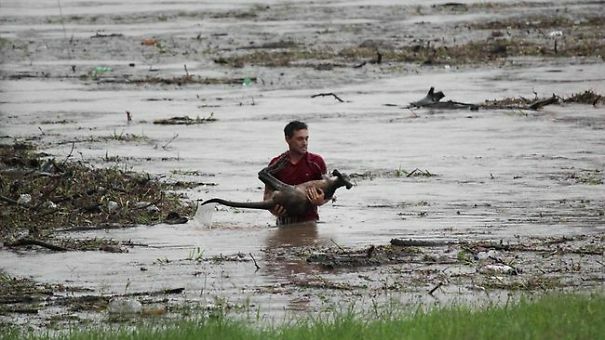 Man risks own life to save a wallaby drowning in flood waters. 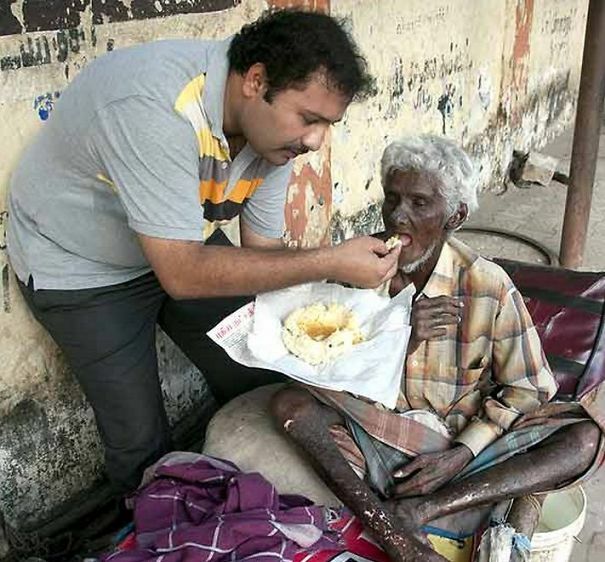 Krishnan was an award-winning chef, he quit his job to serve homeless and mentally disabled. 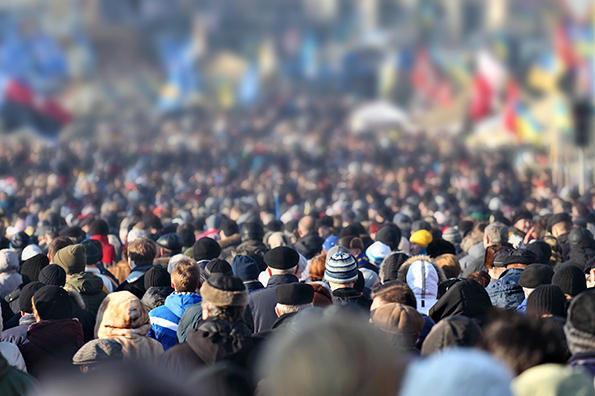 The appearance of our fellow man can be, and regularly is, very deceptive. 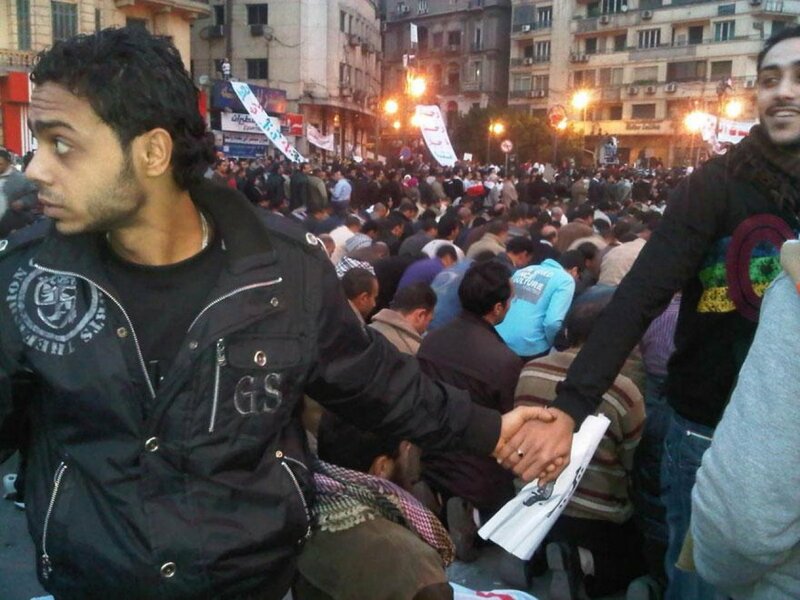 February 2011, Egypt Christians join hands to protect Muslims as they pray during Cairo protests. 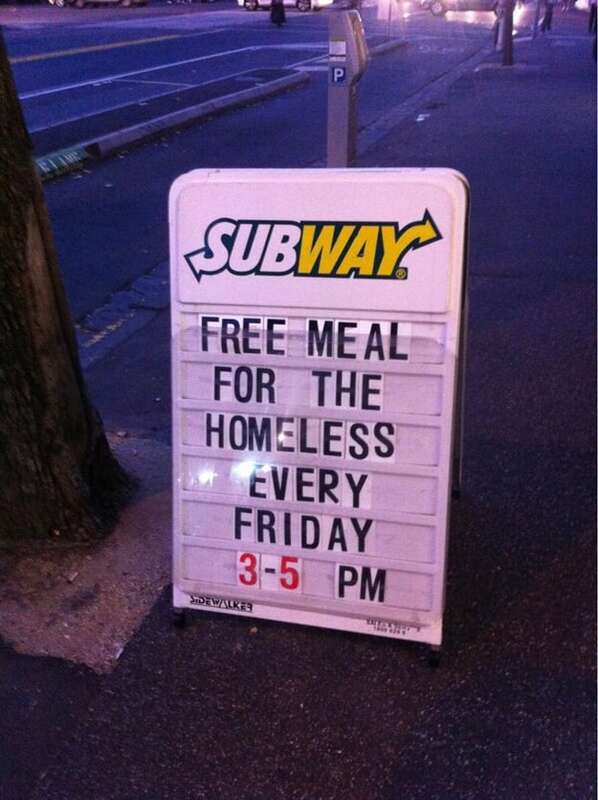 This sign at an awesome Subway restaurant. 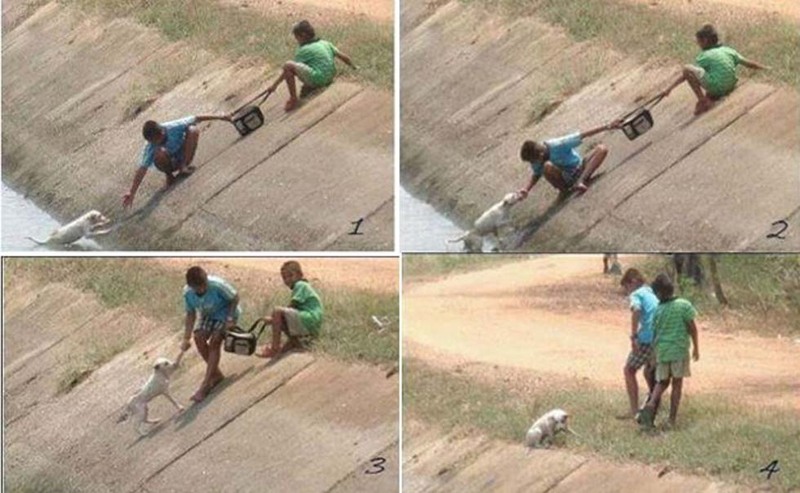 These photos of two children in Sri Lanka collaborating to rescue a dog who had fallen into a ravine. 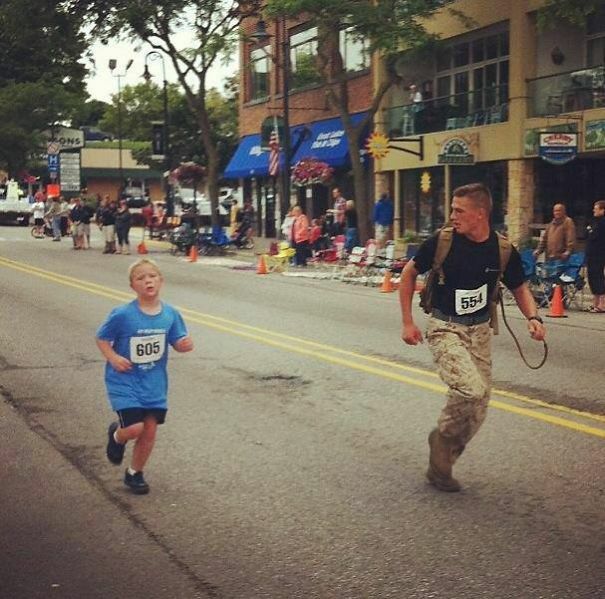 This marine finished the race last so he could help this little boy who got separated from his group. 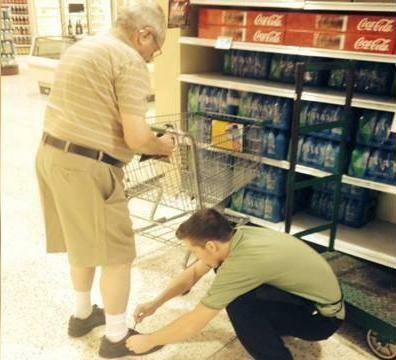 This employee decided to give an elderly gentleman a hand with tying his shoes. 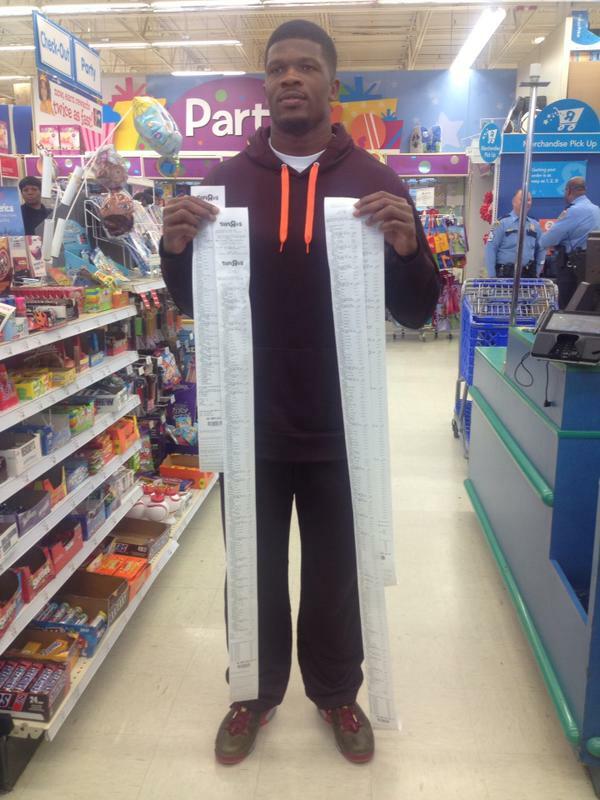 Wide receiver Andre Johnson decided to give some children in Child Protective Services ten seconds to get whatever toys they wanted from Toys R Us—and these are the receipts. 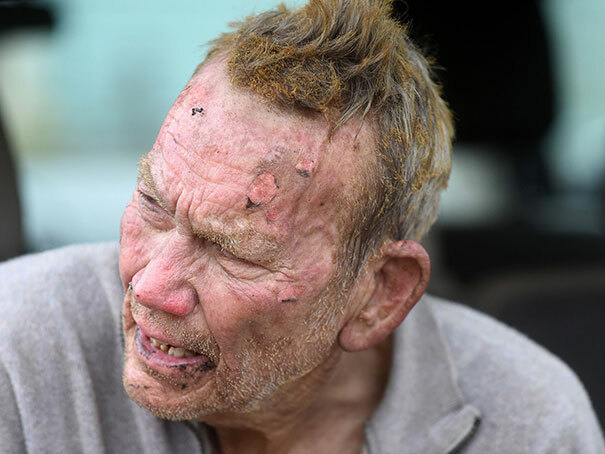 This man burned his face in the process of rescuing dogs from his burning animal shelter. 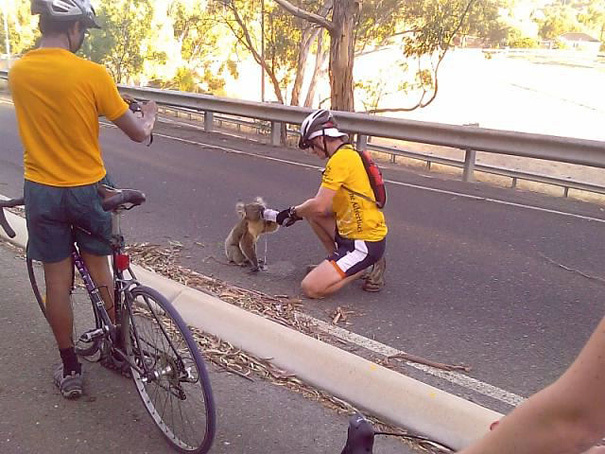 These bikers decided to stop and offer this thirsty koala a much-needed drink of water. 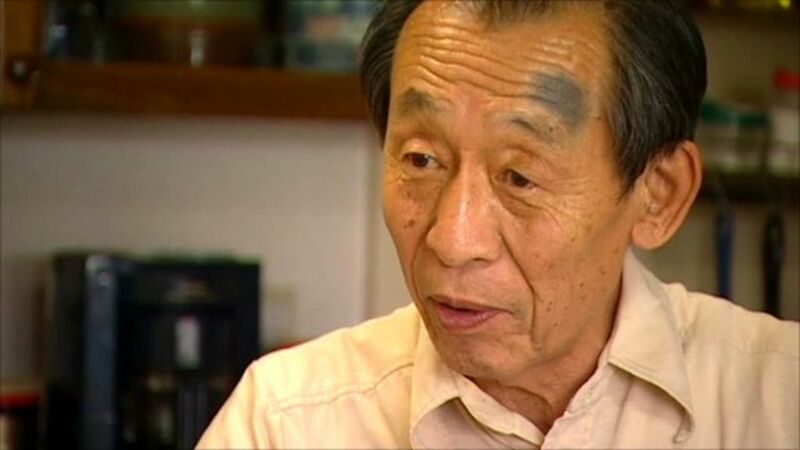 Japanese senior citizens volunteered to tackle the nuclear crisis at Fukushima power station so that young people wouldn't have to subject themselves to radiation. 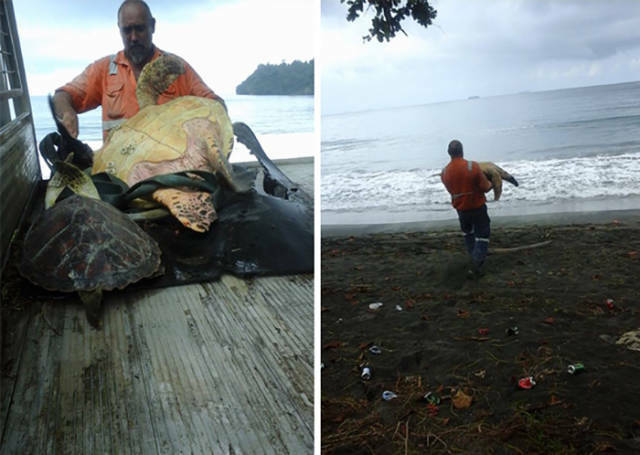 Man Buys Turtles From Food Market And Releases Them Back To The Sea. Heroic Boy Risks His Life To Save A Drowning Baby Deer From Floodwaters In Bangladesh. These Guys Cut Lawns Only For Those Who Can't. 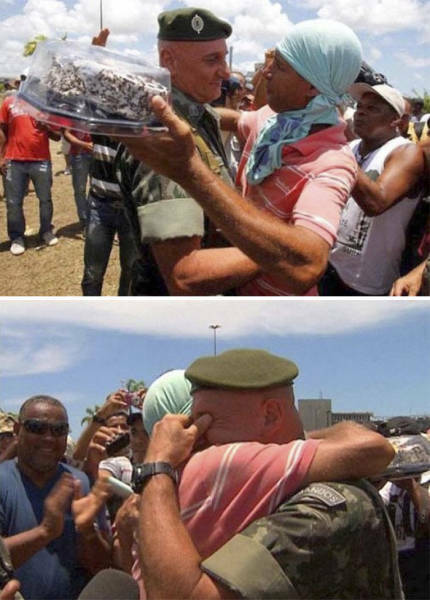 During A Protest In Brazil, One Officer Said, "Do Not Create Episodes Please, Not On My Birthday." Shortly Thereafter, A Group Of Protesters Surprised Him With This. 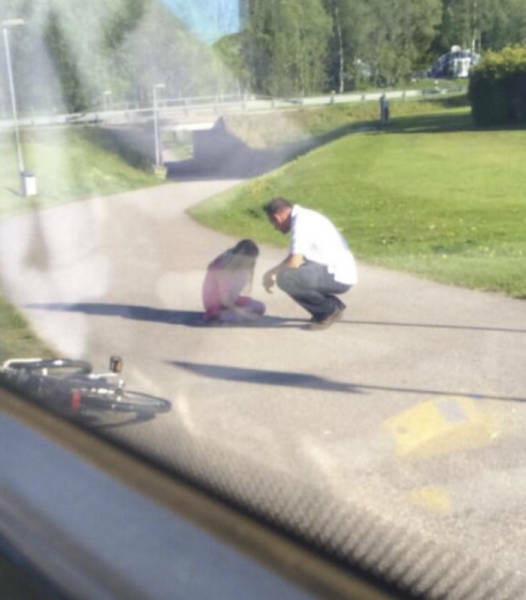 A Bus Driver Got Off The Bus Full Of People To Help A Crying Girl. 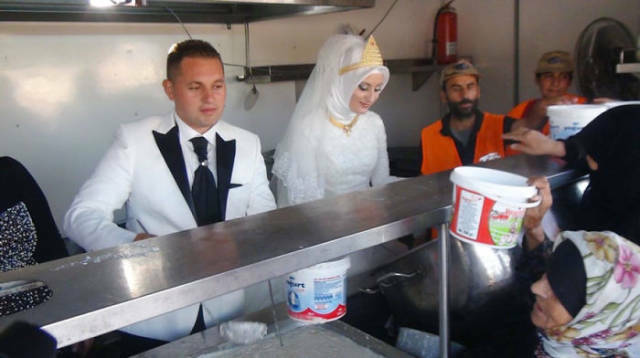 Turkish Bride & Groom Spend Their Wedding Day Feeding 4,000 Refugees. 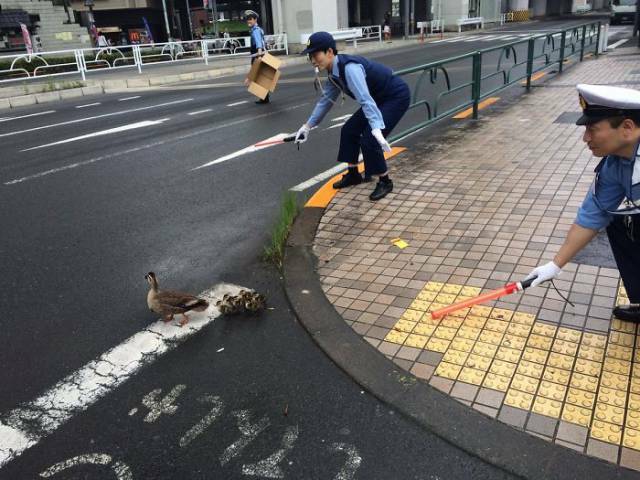 Japanese Police Officers Helping A Duck Family Cross The Road. 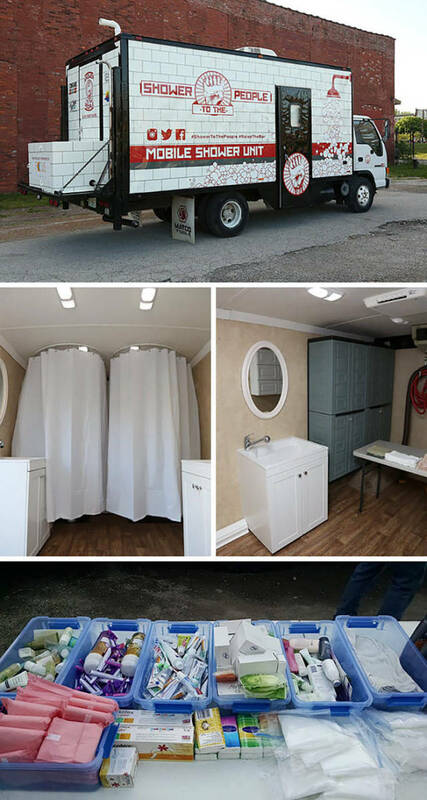 Man Turns Old Truck Into Mobile Shower For Homeless People. 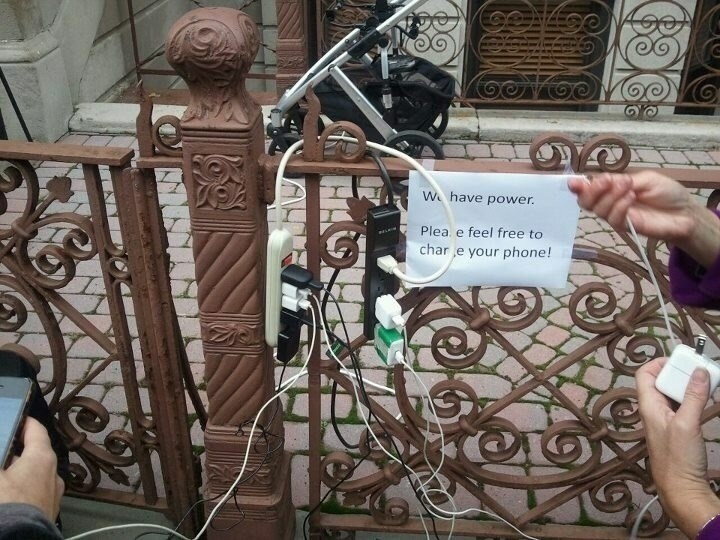 A friendly neighbor on the East Coast offered power to those who need it after Superstorm Sandy hit. 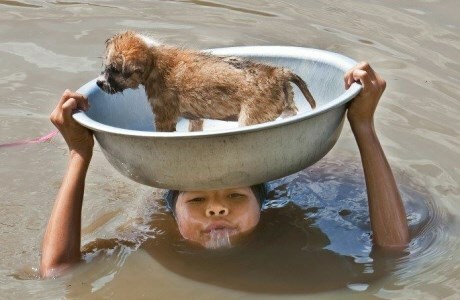 A young boy puts himself in danger to keep his dog safe during a flood. 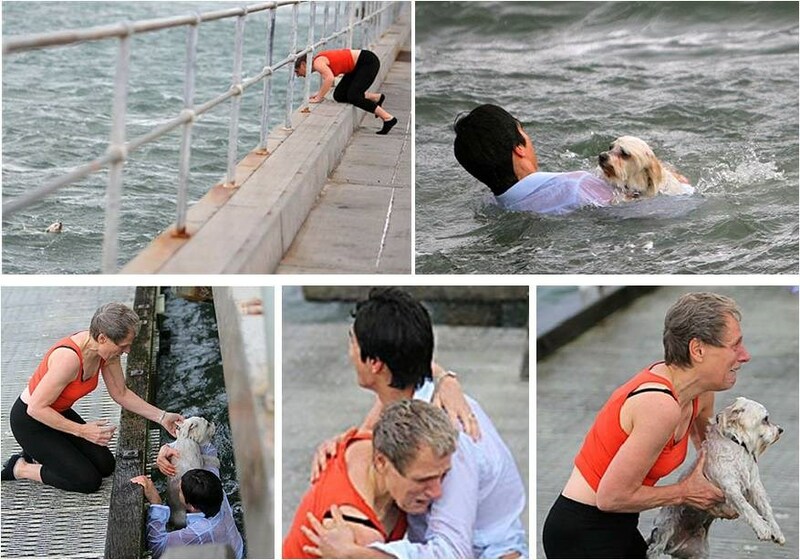 A young passerby rescuing stranger's Shih Tzu who was hurled into the rough water by strong wind. 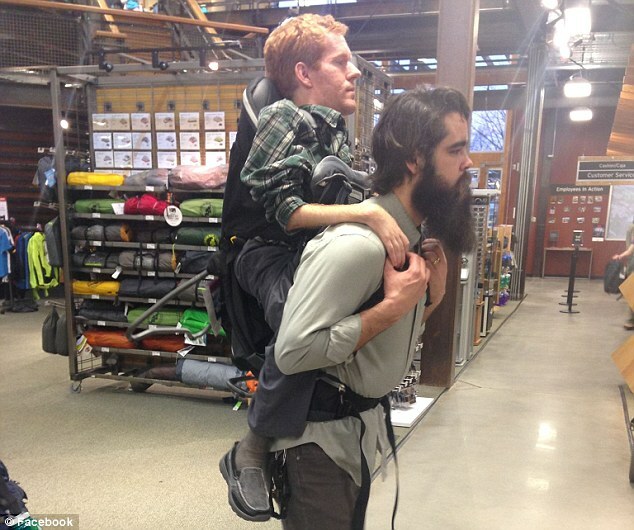 Friends carried their 65lb friend who suffers muscular atrophy across Europe on their backs to give him the trip of a lifetime. 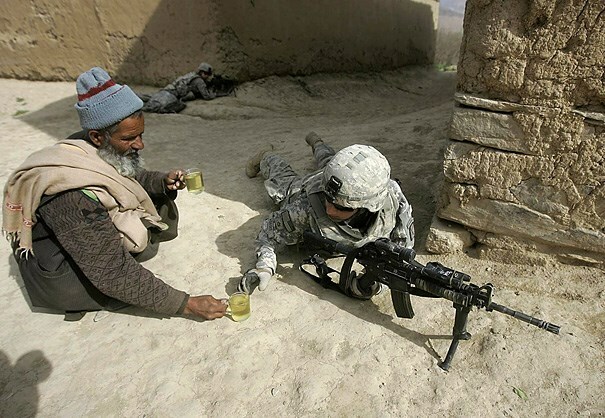 An Afghan man offers tea to thirsty fighting American soldiers. 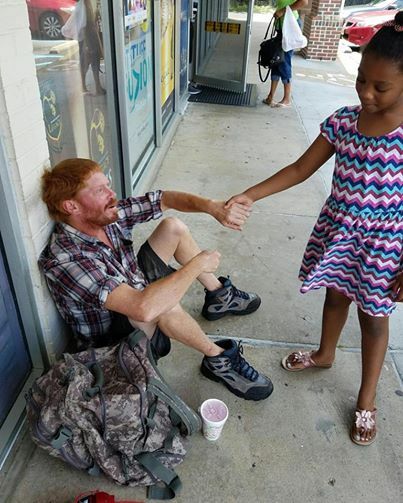 This 6-year-old comforted a homeless man and gave him a few dollars from her purse. 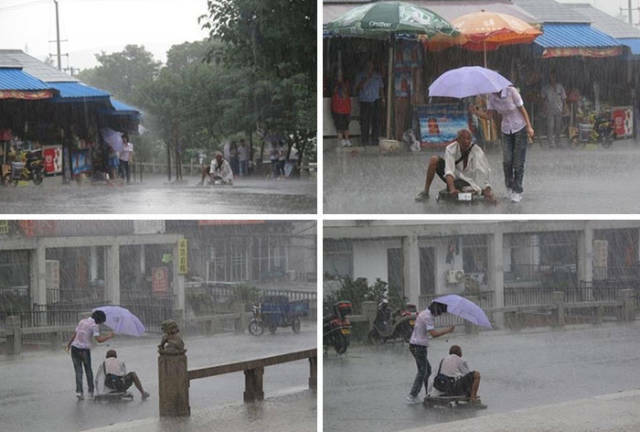 Woman covering a soaked man with her umbrella. 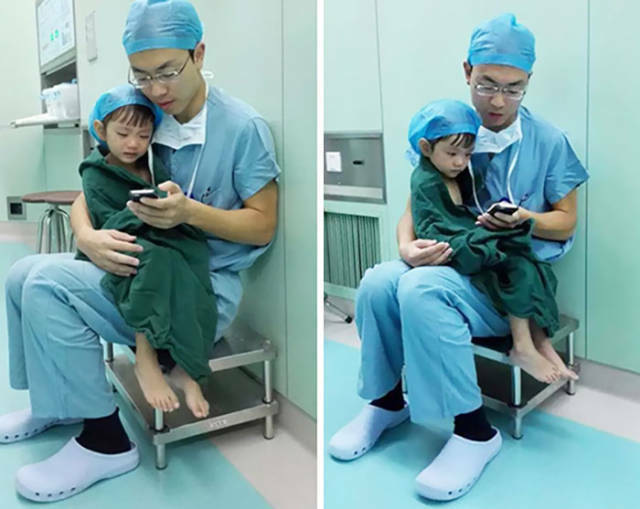 Heart Surgeon Calms Weeping 2-year-old Girl Before Heart Operation. 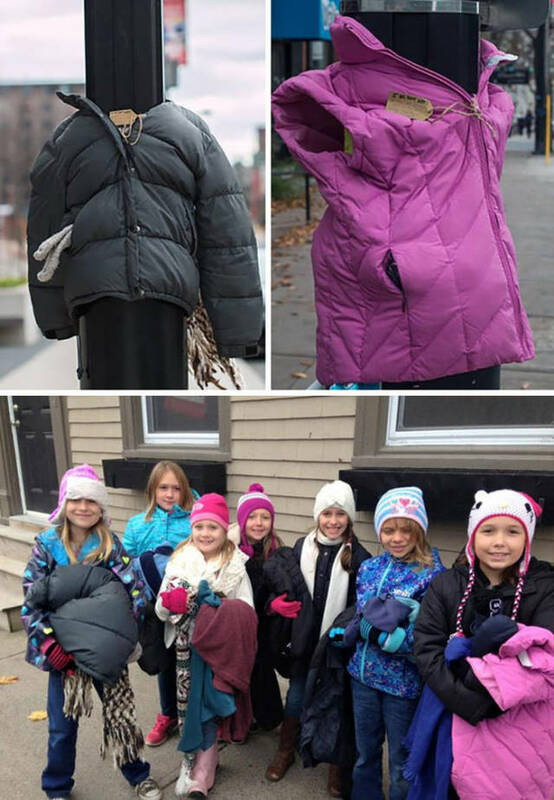 These kids in canada tied coats to street poles to help homeless prepare for winter. 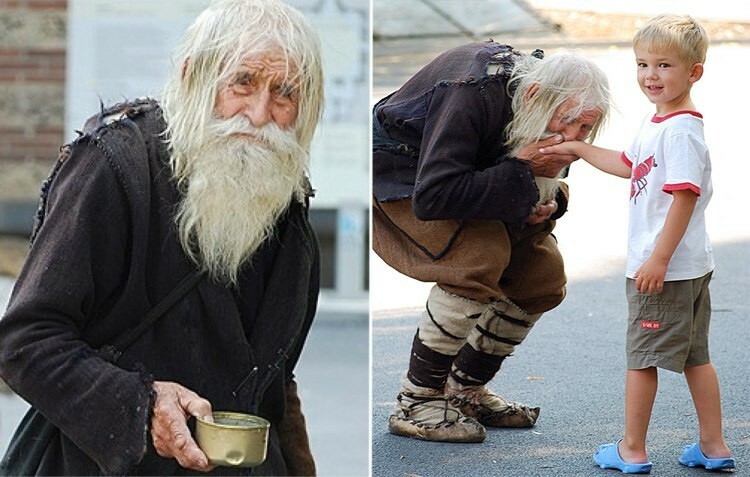 Dobri Dobrev, a 102-year-old-man, begs every day and gives away all he gets to churches and orphanages. 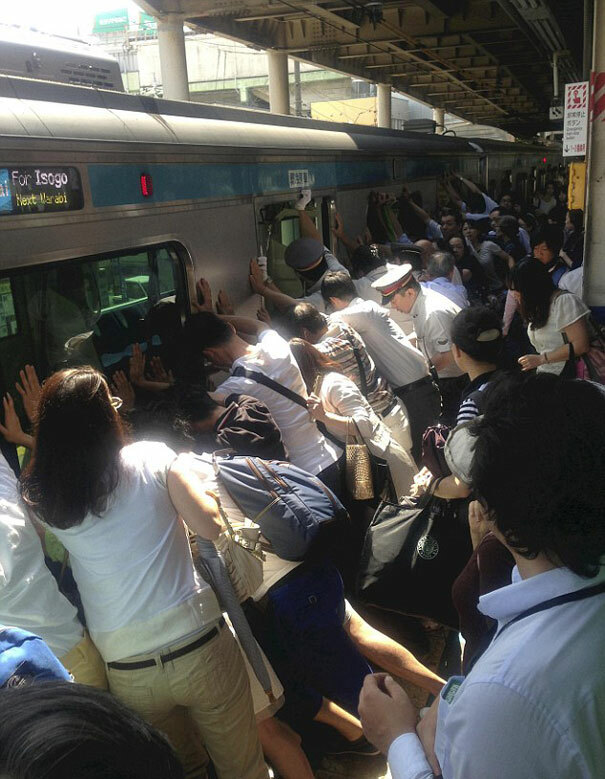 Dozens of japanese train passengers pushed 32-ton train car away from platform to free woman trapped in gap. 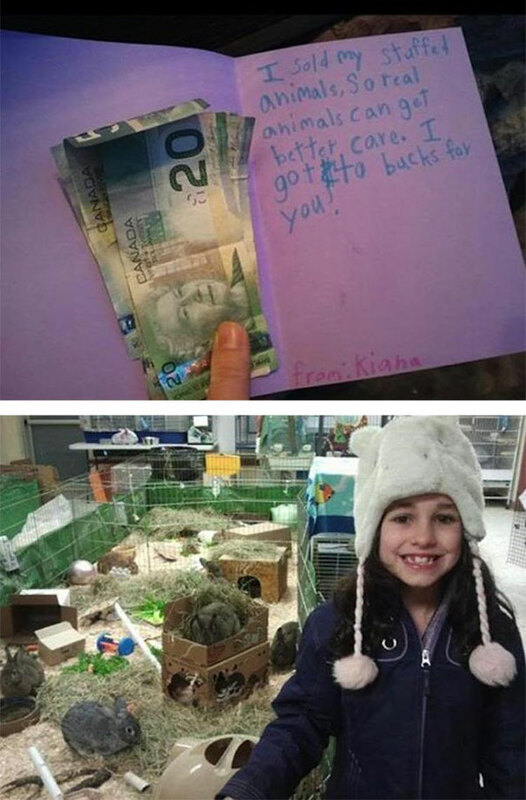 Girl sells her stuffed animals and donates the money to a local animal shelter. 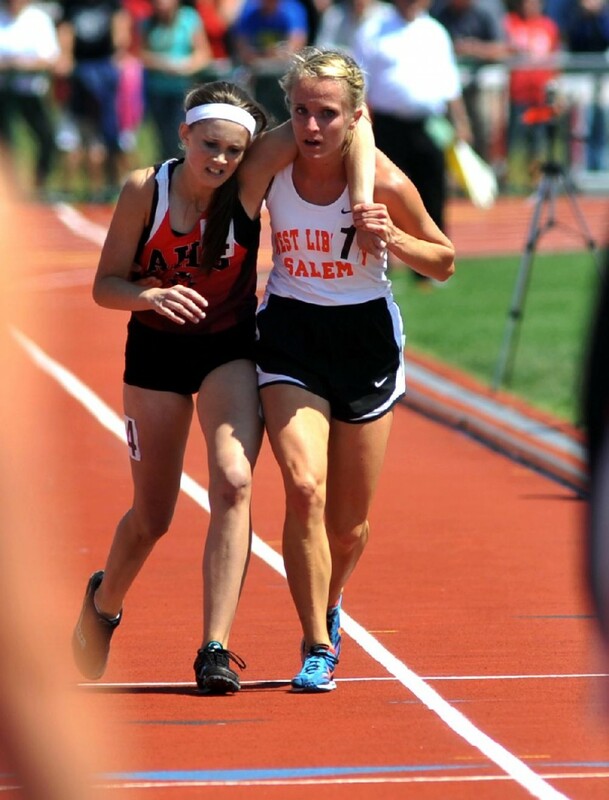 The moment in which this Ohio athlete stopped to help an injured competitor across the finish line during a track meet. 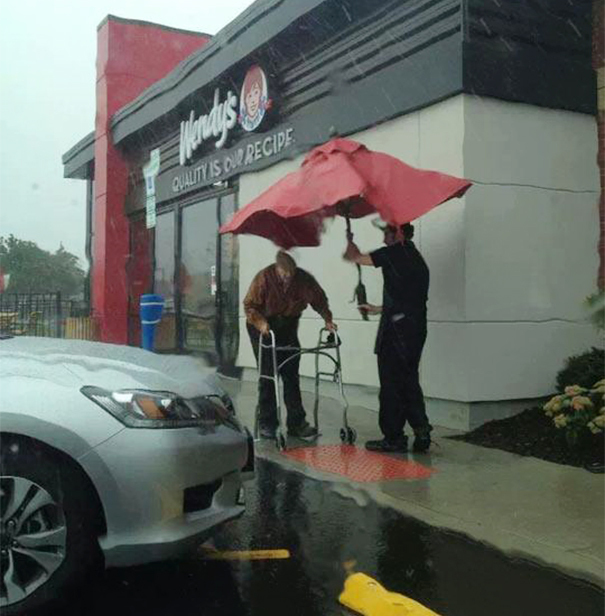 Wendy’s employee removes umbrella from table to protect elderly man from rain. 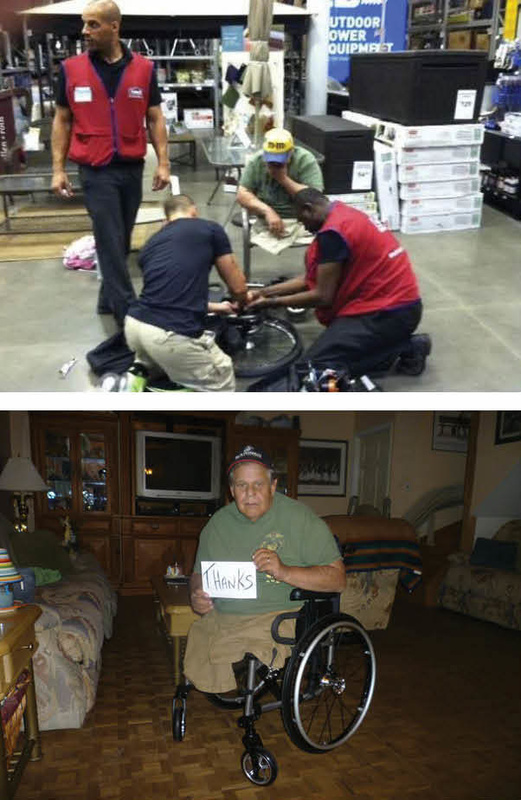 This man's wheelchair broke at Lowe's, and the employees stopped everything to fix it for him. 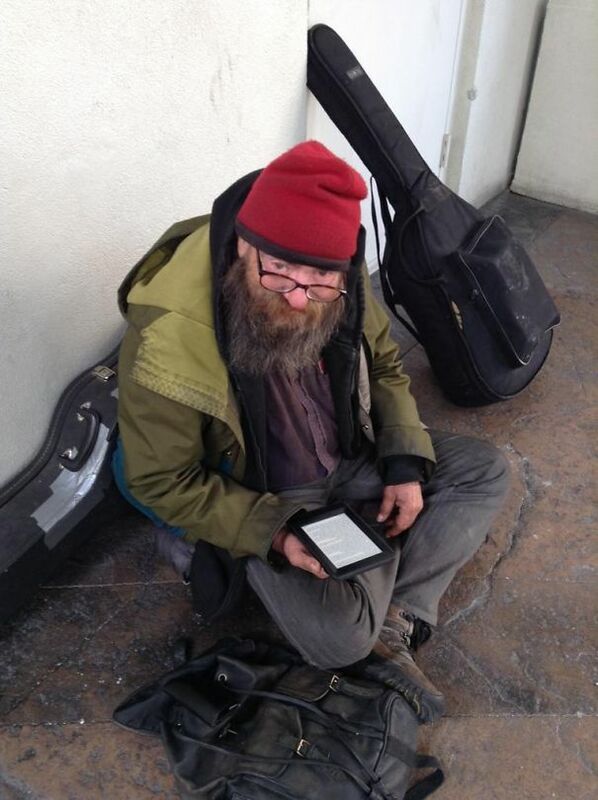 This homeless man was seen reading the same book over and over, so a kind man gave him a kindle. 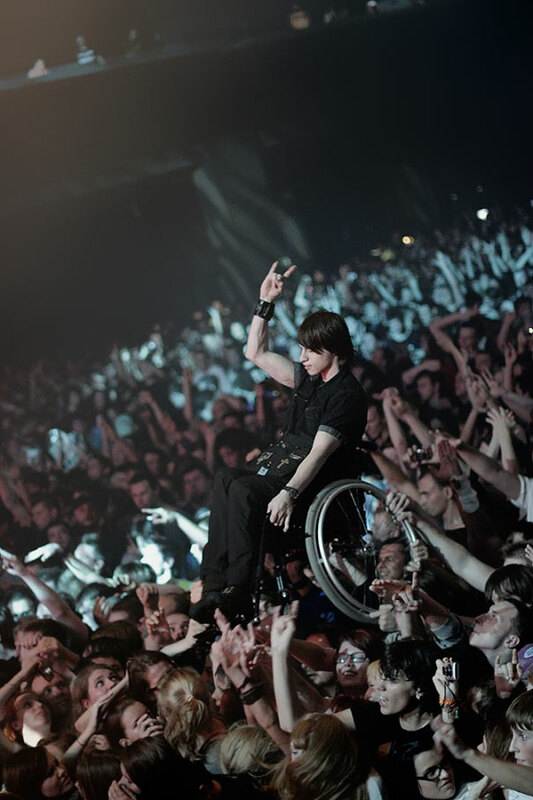 Fans hold up handicapped friend at korn concert in moscow. 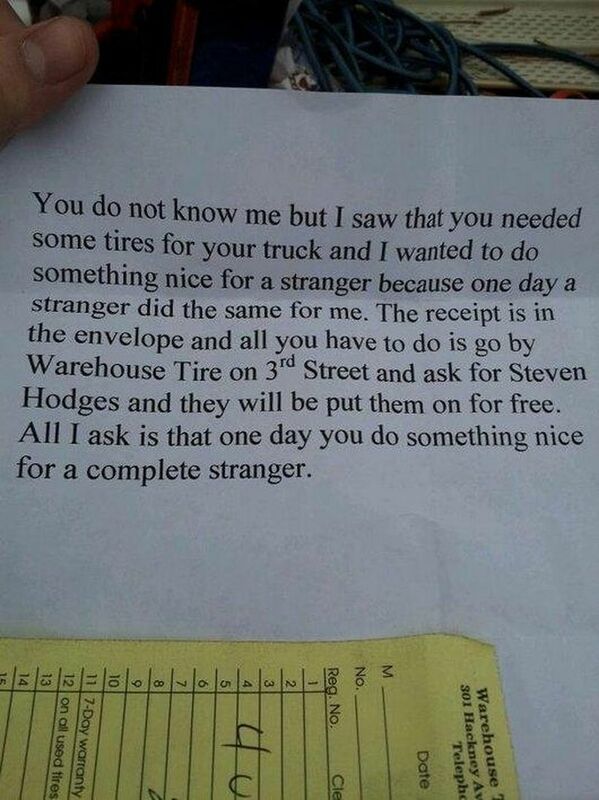 Random act of kindness with request to pay it forward.